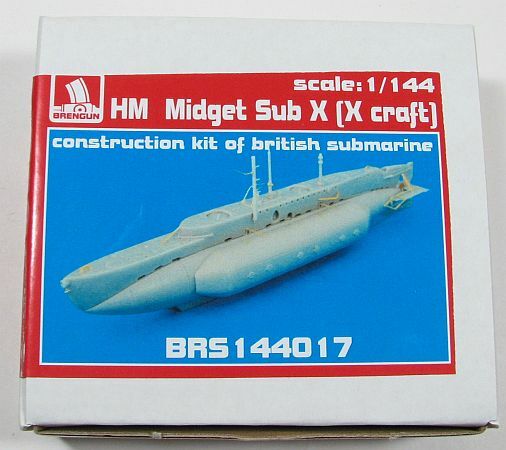 The X class British mini submarines were individually known as X-Craft. They were meant to be towed behind a larger vessel, and when their intended target was "close enough", then the crew of the sub was rowed out to the X-Craft being towed and their assignment would begin. When finished, they would again come along the larger vessel, tied to it, then the crew brought back on board. One of the more famous uses of the X-Craft submarines was the damaging of the German battleship Tirpitz. While only two were able to lay mines out of a total of six starting out, it was enough to damage the Tirpitz enough so it was out of use from when the attack happened, in September, 1943, until April, 1944. There were twenty X-Craft produced. The Brengun 1/144 X-Craft is a very nicely molded resin-and-photoetch kit. There are ten pieces of gray-green colored resin and a photoetch fret with 23 pieces on it. I have found two air bubbles that will need to be dealt with (on one of the rudders) but the rest of the resin looks top notch with no obvious flaws. In fact, this is some of the best molded resin I have seen. Construction couldn't be simpler, although the photoetch will take time and patience. 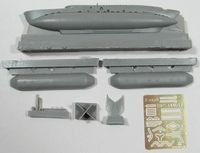 Once the main hull and two side-cargo pieces are removed from their pour-blocks, then after those three pieces are assembled, the rest of the smaller resin pieces are added. I would wait to add the periscope and other pieces to the top of the hull until you have glued on all the photoetch, that way you're not constantly knocking them off as you apply the photoetch pieces. The biggest number of photoetch pieces are for the rear of the craft, being control rods and cables for the rudders and other support for this area. Other photoetch pieces are for the sides of the cargo pieces, where it attaches to the hull, more pieces for the top of the hull, as well as the screw. Since there were no markings applied to these vessels you'll only need to worry about painting the sub, naturally after everything is glued on. Since there isn't much to this kit, construction will only take as long as applying the photoetch takes, which is the proverbial "long pole in the tent". When finished, the Brengun 1/144 X-Craft will look great and you'll have something unique on your shelf. You'll need to figure out how to display it, though, as there is no base contained in the package. I want to thank Brengun for allowing me to review this kit.